Is it just yours truly, or is there electricity in the air on this Beer Summit Eve? Now, I know a lot of ye socks have criticized The ObamaNation for hosting this event at all. And, I understand the reasons for believing it is beneath the dignity of the White House to get involved in a petty issue like the scrap between Professor Henry Gates and Officer James Crowley--much less propose to act as referee over adult beverages. 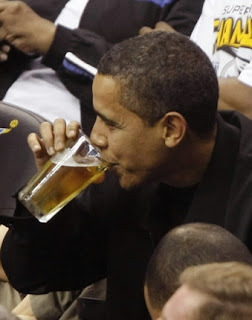 I don't know why folks are getting upset now, since we now have a pretty good explanation why we've seen such interesting behavior in and around the executive mansion in recent months: beer! Is that whole multi-trillion dollar deficit thing beginning to make sense to you now? And, you thought they were just drunk on their own power as they went about shackling us and future generations with staggering debt and concocted schemes to hijack Wall Street, Detroit, and the nation's healthcare system! It was just the beer talking, all along! But, here's my thought. The problem here isn't too much drinking in the West Wing. Rather, there's not been enough! If we could just convince a patriotic distributor to commit to delivering a keg or two to 1600 Pennsylvania Avenue every day, maybe these jackasses* would get plowed and pass out before they could do any more damage! And, while they're at it, maybe they could drop a couple off at the other end of The Mall to keep our illustrious legislators busy, too . . .